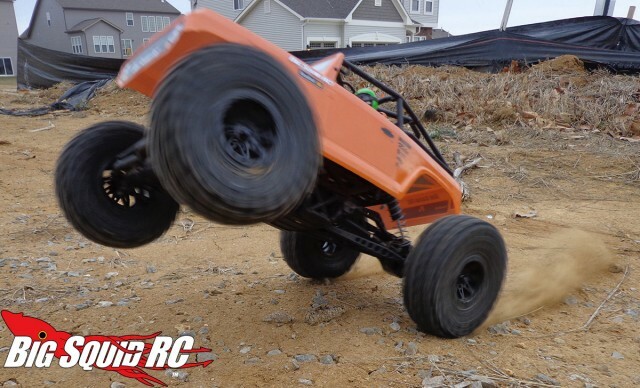 Axial Deadbolt Mega Truck Conversion: Part 1 « Big Squid RC – RC Car and Truck News, Reviews, Videos, and More! I knew I wanted to base the truck off of the Axial Deadbolt platform due to the stout AR60 axles, rugged transmission, rabid aftermarket support, and my familiarity with the model. I’m getting to the point where I think I could build a truck just with all the spare Axial parts I’ve accumulated over the years. I also knew that for this truck to do everything I wanted I’d have to get pretty wild with the modifications. It would need a powerful brushless system, had to be waterproofed for deep mud, needed big tractor tires to navigate said mud, and required a suspension that could handle speed and air. A very tall order. The crux of this build is a Crawford Performance Engineering (CPE) Barbarian chassis (pic below). 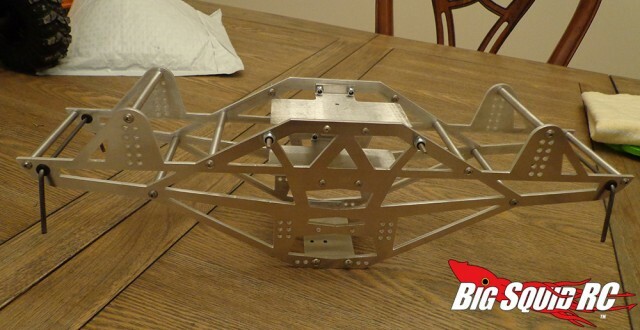 It turns an Axial Wraith, Deadbolt, or Ridgecrest into a scale monster/mega truck by utilizing the stock axles, shocks, transmission, and other miscellaneous pieces. 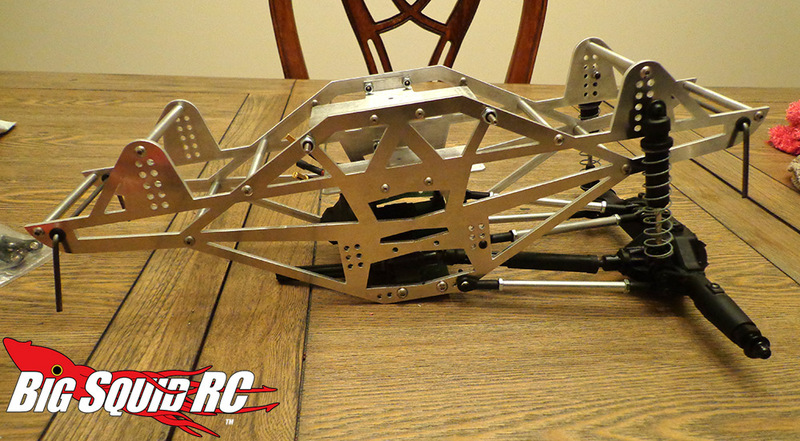 The all aluminum 1:1 inspired frame features heavy duty links and sway bars and adds about an inch of wheelbase to the stock Deadbolt. This has become the hot setup in scale monster truck racing and I’m pretty excited to build a mud truck out of it. With my plans now in place I ordered a slew of parts. I already had the motor on hand so I decided to throw that in the stock truck and see how the drivetrain would handle it without any modification. I pulled out the RTR ESC and 20t motor to install a Castle Mamba Max Pro 6900 kv system. Go big or go home! The result was impressive. The big motor yanked the front wheels up with hardly any throttle (see the top pic). The change in power was akin to going from a V6 to a super-charged big block. I’m also happy to report that the stock Axial drivetrain held up to this big power with no breakage whatsoever. It also jumped surprisingly well considering this vehicle was presumably designed without hang time being a big priority. After a little over a week, all my parts had finally arrived. It was time to start building. Part 2 of this series is coming up very soon, but here’s a teaser (see below) showing off the Barbarian chassis with the Deadbolt rear end partly installed. Before we go, I’d be remiss if I didn’t mention the tires I’m planning on using. Can you say cut & shut Clodbuster wheels/tires narrowed to about 2 inches? That should nail the tractor look I’m going for. Look for Part 2 of this build series coming soon!